The Federal Reserve Board on Tuesday announced final rules to restrict the fees and expiration dates that may apply to gift cards. The rules protect consumers from certain unexpected costs and require that gift card terms and conditions be clearly stated. (3) the consumer is given clear and conspicuous disclosures about the fees. Expiration dates for funds underlying gift cards must be at least five years after the date of issuance, or five years after the date when funds were last loaded. 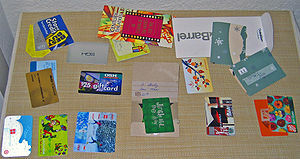 The Board's rules generally cover retail gift cards, which can be used to buy goods or services at a single merchant or affiliated group of merchants, and network-branded gift cards, which are redeemable at any merchant that accepts the card brand. The final rules are issued under Regulation E to implement the gift card provisions in the Credit Card Accountability Responsibility and Disclosure Act of 2009. The notice that will be published in the Federal Register is attached. The final rules are effective August 22, 2010.